The Endeavour luminaire designed by EcolightingUK is a great example of the company’s expertise in producing bespoke LED luminaires for client lighting schemes. Suffolk County Council needed an LED lighting solution for their open plan council offices and as there was no wish to fit entirely new luminaires, the brief to Ecolighting was to retrofit existing ceiling surface-mounted luminaires with LED lighting. The attractive circular fittings, mounted on the 600 x 600 ceiling modules, were stripped of their previous fluorescent lighting and control gear and replaced with a bespoke LED panel especially designed and manufactured by Ecolighting. The 350mm diameter panel has 144 LEDs mounted in concentric rings. The panels have a total power consumption of just 28w and with a luminous efficacy of 140 lumens per watt produce 3920 lumens per panel. They have a long life expectancy of 50,000 hours with a colour temperature of 4000K and colour rendering index of Ra80. Ecolighting offers a versatile product range using the latest LED technology creating bespoke solutions for all types of applications. The company offers full turn-key solutions and unlike many other lighting companies Ecolighting has its own team of lighting and electrical installation engineers as well as carrying out the lighting scheme design with Relux software in the early stages of client lighting projects. The company also manufactures its luminaires in the UK and uses UK-sourced Osram control gear and LED chips. All of this means that the company has much better control than many and can present better value for money to clients. 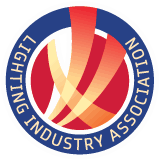 The company is also a Carbon Trust Accredited Supplier, assessed to BSEN ISO 9001:2015 and are members of the Lighting Industry Association. As one of the UK leaders in LED lighting solutions to commerce and industry, Ecolighting has worked with many other organisations such as Kuehne Nagel, Man Truck & Bus, Carlsberg, Debenhams, Culina and Cadburys.